Clave (pronounced clah vay) is the rhythmic pattern that forms the basis of Latin music. Clave is phrased in what is known as a 3/2 (forward clave) or 2/3 (backward clave) feel. That is, three beats then two beats, or vice versa. 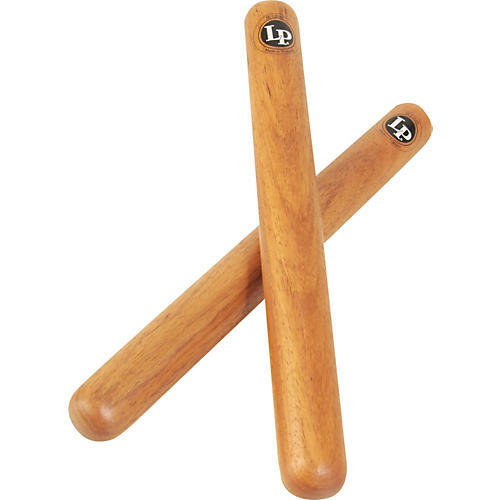 Claves are the traditional instruments used to play clave and are comprised of two sticks that are struck together to get a sharp, cracking sound. One is called the Clave or male, while the other is called the Striker or female. The Clave lays in one hand between the fingertips and the heel of the hand, with the thumb out for support. This space between the Clave and the palm of the hand creates a sound chamber. The Striker is held as a beater in the other hand and is struck against the Clave.